LONDON: Vandals have smashed and defaced the London tomb of Karl Marx in what the cemetery said appeared to be a deliberate attack against the philosophers ideology. 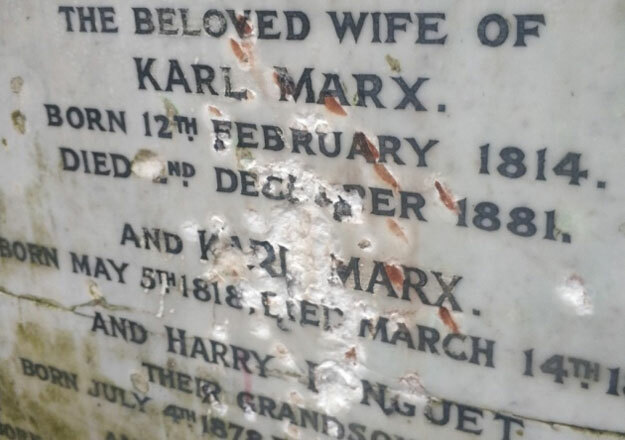 A marble plaque with the names of Marx and his family the moments oldest and most fragile part was repeatedly hit with a blunt metal instrument, Ian Dungavell, who runs the cemetery trust, said on Tuesday. The name of Karl Marx seems to have been particularly singled out, so it wasnt just a random smashing up of a monument it seems a targeted attack on Karl Marx, said Dungavell, chief executive of the Friends of Highgate Cemetery Trust, the charity which runs the graveyard. The lettering and stonework was damaged, particularly around Marxs name, the date of his wifes death and the name of their grandson Harry Longuet, who died aged four. The idea that you can disagree with someones thoughts by smashing up a monument seems a particularly inarticulate way of going about debate, said Dungavell. Its battle-scarred and has all the marks of a rich and varied life, said Dungavell. Its not irreparable but it will never be the same again.